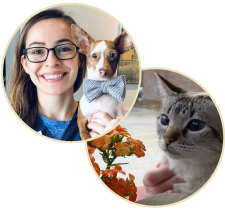 Julia joined Whole Pet in 2018 to pursue a career in the world of veterinary medicine and is grateful for the opportunity to help make an impact in the lives of pets and their owners in the community. She graduated from Carleton College in 2016 and spent two years working in the Madison area before deciding to return to school to complete prerequisites for a DVM program. She is delighted to be a part of the incredible team here at Whole Pet Clinic. In her free time, she enjoys spending time with her little dog, Arlo, and cat, Sadie, as well as spending time outdoors in the summer, or inside by the fire in the colder months, with family and friends.